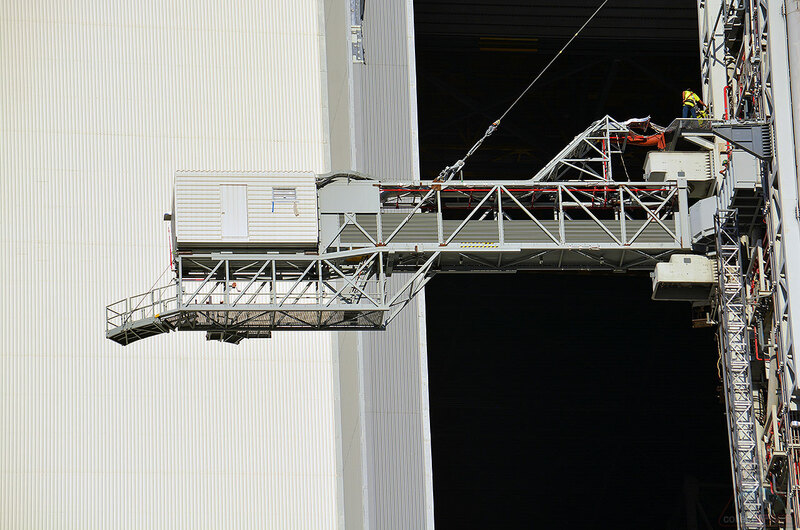 — In a scene straight out of NASA's past, a towering gantry was rolled into a large rocket hangar on Saturday (Sep. 8), where it will undergo checks to support the space agency's future. 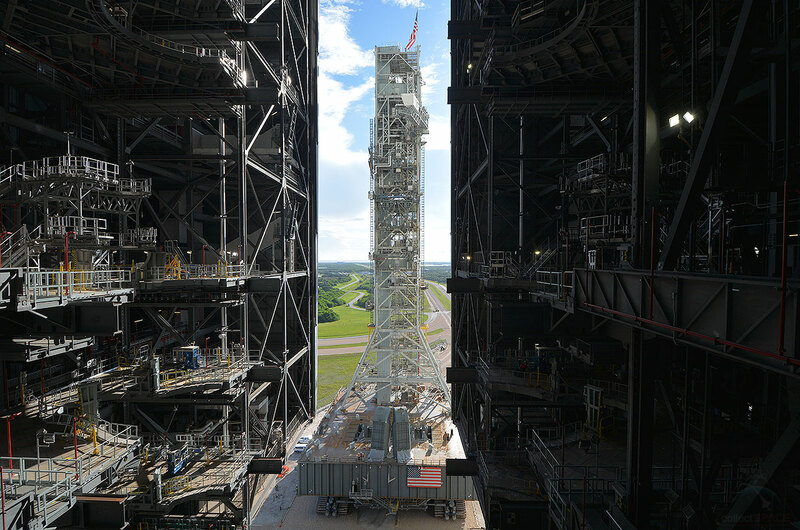 The mobile launcher (ML) that NASA plans to use with its Space Launch System (SLS) rocket still under development entered the Vehicle Assembly Building (VAB) at the Kennedy Space Center in Florida, completing a 9-mile (15-kilometer), week-long test drive to its launch pad and back. "Today, what you are witnessing is the first step of the next big step for the Exploration Ground Systems program — multi-element verification and validation — where we are going to prove that our systems will work as designed and also operate as we expect them to," said Cliff Lanham, NASA's project manager for the mobile launcher, during a press event on Saturday. The slow-moving roll atop an upgraded Apollo-era crawler-transporter marked the first time that the SLS-configured platform was brought inside the VAB. 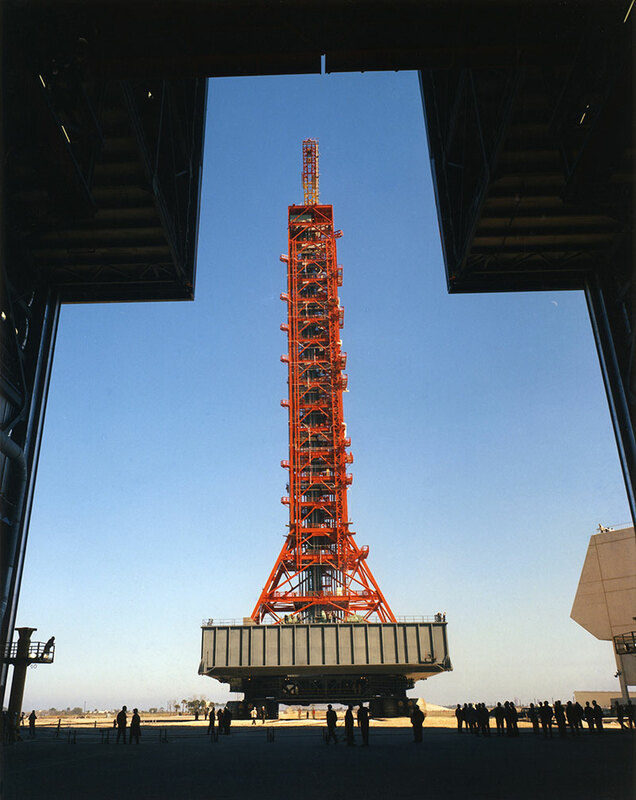 The last time that a tower-topped mobile launcher entered the 525-foot-tall (160-m) building was at the completion of the Apollo program more than 40 years ago. 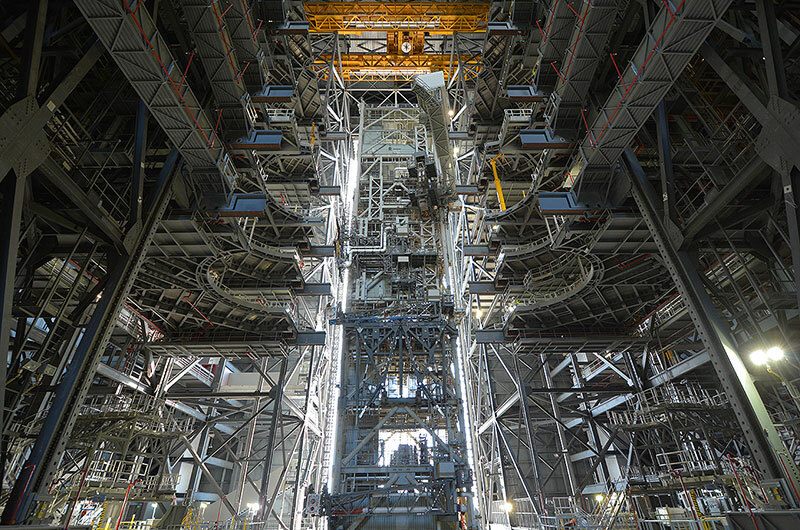 The nearly 380-foot-tall (115-m) SLS mobile launcher stands about the same height as its predecessor and serves the same purpose — to provide a platform, umbilical connections and access to the rocket in the lead up to a launch. The Apollo-era towers, which supported Saturn V and Saturn IB rockets, were primarily red in color, had nine swing arms and were each topped by a hammerhead crane. 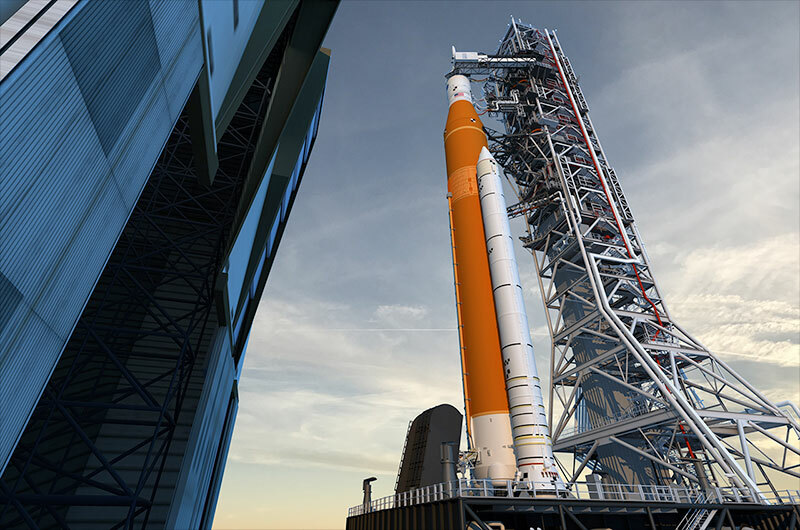 The SLS tower is gray, has five swing arms — including a walkway that astronauts will use to enter an Orion spacecraft atop the rocket — and levels out at its top. 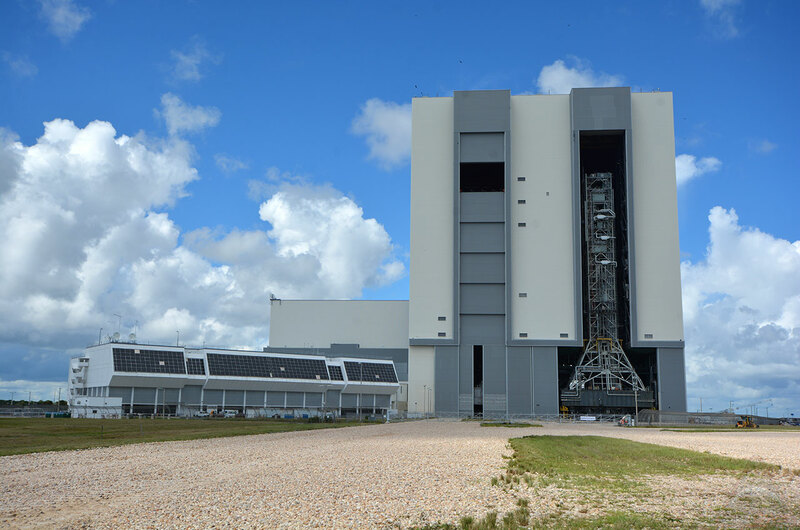 The move, which began on Aug. 30, marked the beginning of a new phase for the ML, which was originally constructed for NASA's former Constellation program and has been undergoing modifications to support the SLS in a workyard outside the VAB since 2015. The rollout to the pad was to ensure that all of its systems functioned as designed. "Our primary purpose was to ensure our major structural systems could interface to the pad appropriately," said Lanham. "We sat down on the pad very well and we also got to exercise our operational teams so that they could get a handle on their protocols." Traveling at the crawler's top speed of 0.7 miles per hour (1.1 k/ph), the ML arrived on Pad 39B on Aug. 31. Over the course of several days, engineers made sure the pad's water suppression systems aligned with the ML and the environmental control system that will feed air and gaseous nitrogen purges to the SLS rocket through the tower's umbilicals hooked up properly with the mobile launcher's ducts that will distribute them. 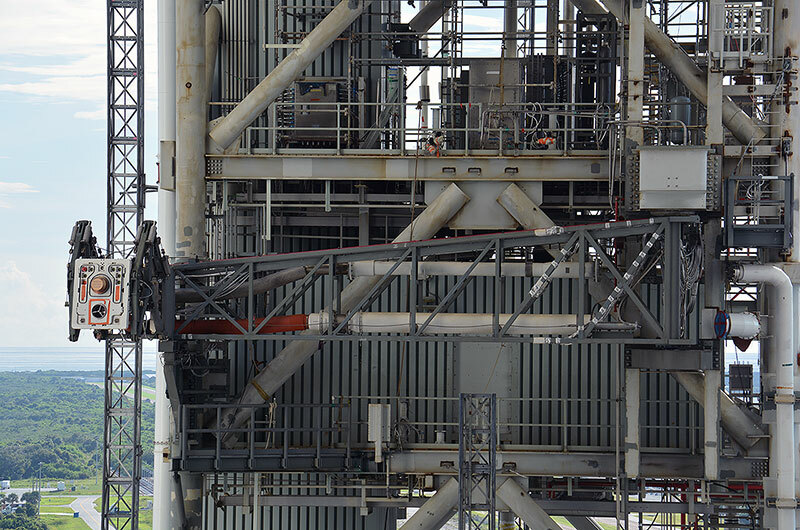 The cryogenic system lines from the ML to the pad were also checked and remote commanding from the Launch Control Center (LCC), located adjacent to the VAB, was also verified. 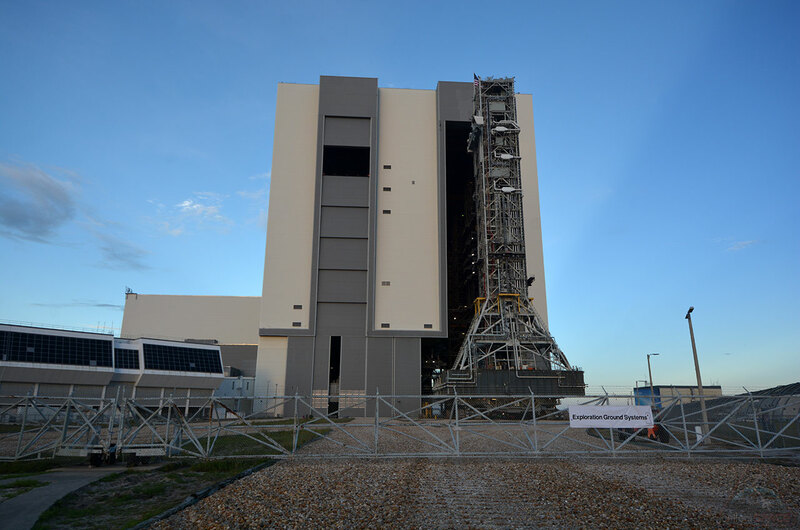 Arriving back at the VAB on Saturday, the test drive was the first of the platform's four planned rollouts to Pad 39B in the lead up to the maiden launch of the SLS on NASA's uncrewed Orion Exploration Mission-1 (EM-1), targeted for mid-2020. "We like to call this our 'EM-0,' because we are going to test every system from the top end to the low end of its requirements, make sure it works and that we can process the vehicle safely," Lanham told reporters. 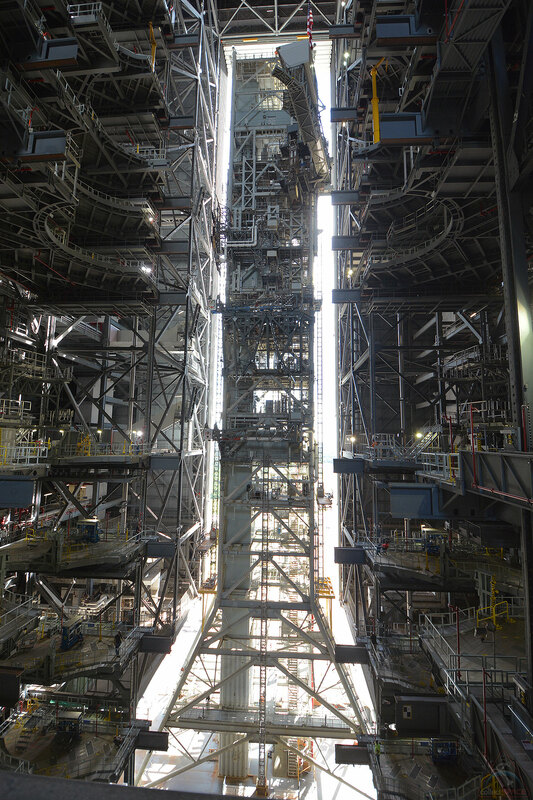 "We'll be in the VAB for about seven months doing our multi-element verification and validation. We will be swinging the umbilical arms multiple times to make sure we can locally control the arms from the mobile launcher and then also making sure we can control the swing arms from the Launch Control Center," he said, adding that other tests will include verifying the interfaces that will connect the ML to the rocket and ensuring the alignment between the umbilical tower's levels and the SLS work platforms installed in the VAB. 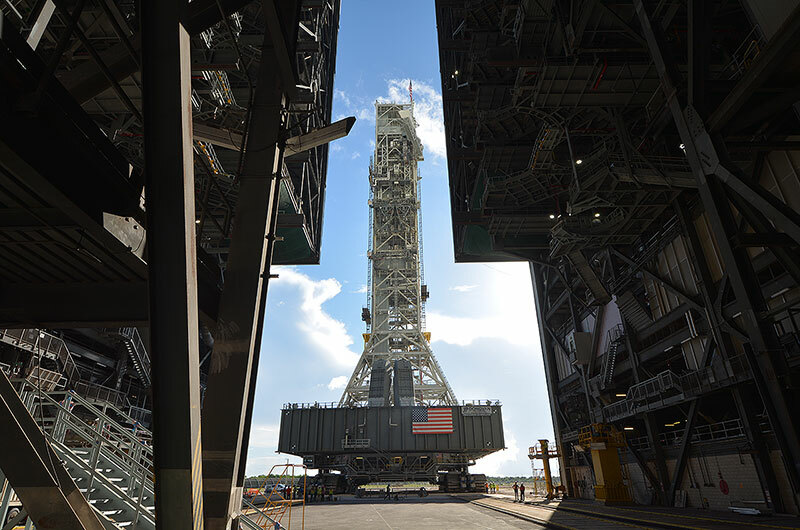 "After seven months, the crawler will come back in, pick up the mobile launcher and head out to the pad for another four to five months of multi-element testing out at the pad," described Lanham. After that, the ML will return to the VAB to support assembly of the first SLS rocket, which it will then take to Pad 39B for a "wet" (or fueled) dress rehearsal about a month before the scheduled EM-1 mission. Finally, the mobile launcher will return the rocket to the VAB for removal of test apparatus before again rolling it out to the pad for launch. "This is a significant event because when I look at [what we did today], I say 'Hey, I'm just three rolls from launch,'" said Charlie Blackwell-Thompson, NASA's launch director who will oversee the Orion EM-1 countdown through liftoff.